Is glass a solid or a liquid? This question, which has been vigorously debated by specialists in the field for some decades, has just been answered anew: "Glass is a non-equilibrium, non-crystalline state of matter that appears solid on a short timescale but continuously relaxes toward the liquid state." A more elaborate alternative definition is this: "Glass is a non-equilibrium, non-crystalline condensed state of matter that exhibits a glass transition. The structure of glasses is similar to that of their parent supercooled liquids (SCL), and they spontaneously relax toward the SCL state. Their ultimate fate, in the limit of infinite time, is to crystallize." "There are several definitions of glass, but most of them contain serious errors," said Edgar Dutra Zanotto, one of the authors of the new definition. "Many definitions say a glass is a solid, and others say it's an isotropic material [whose properties are the same in all directions], but many glasses are not." Jointly with John C. Mauro, Professor of Materials Science & Engineering at Penn State University in the U.S., Zanotto published an article in which he argues "[glass] structure is very different from that of solids. Glass relaxes continuously and crystallizes." The article was published in the Journal of Non-Crystalline Solids. The researcher points that dozens of articles have already placed glass outside the category of solids due to three characteristics. One of them is that the structure of glass is very similar to that of the liquids from which it is formed. Another is that glass flows (deforms) spontaneously over time in response to minimal pressure, which can be less than the action of gravity. Crystalline solids deform only in response to external pressure that is inversely proportional to temperature. The lower the temperature, the greater the pressure that must be applied to a crystalline solid to deform it, Zanotto explained. "On the other hand, any positive pressure or stress different from zero is sufficient for a glass to flow at any temperature," he said. "The time it takes to deform depends mainly on temperature and chemical composition. If the temperature to which glass is submitted is close to zero Kelvin [absolute zero], it will take an infinitely long time to deform, but if it is heated, it will at once begin to flow." 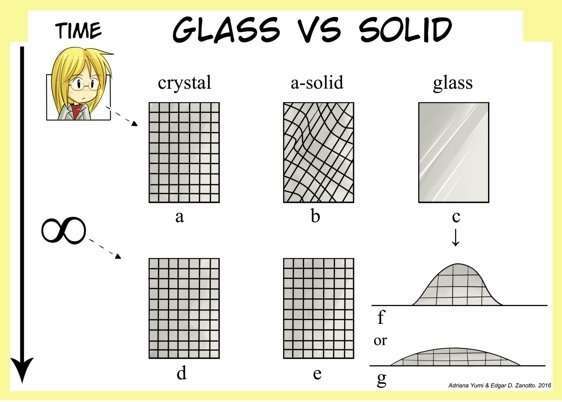 The third characteristic that distinguishes glass from a solid is that at the end of its existence, it eventually crystallizes, whereas a crystal, for example, neither flows nor crystallizes because it is already in a solid state. Based on these three characteristics, Zanotto and Mauro propose to define glass as a "frozen liquid"—a material with the structure of a liquid that has been frozen without crystallizing by being cooled below a certain temperature, known as the glass transition temperature. "It took us a long time to bring together these concepts of solid and liquid, crystal and non-crystal, and frozen, which in the article has the meaning of a temporary state, and to arrive at the modern enhanced definition of glass," Zanotto said. The initiative of proposing a new definition of glass arose when Zanotto gave the Turner Memorial Lecture, entitled "Glass Myths and Marvels," during the Society of Glass Technology (SGT) Centenary Conference at the University of Sheffield in the United Kingdom in September 2016. Zanotto is the first Brazilian to have been invited to deliver the lecture. One of the questions raised by Zanotto during the lecture was precisely whether glass is a solid or a liquid. The question resulted in a heated debate with several scientists in the audience, and especially Arun Varshneya, Emeritus Professor of Glass Science & Engineering at Alfred University in the United States, a well-known "glass guru" and the author of one of the most widely read books on glass in the world. Following the discussion, Zanotto began exchanging emails with Varshneya and writing what would become the Journal of Non-Crystalline Solids article, with the aim of disproving the idea that glass is a solid, as advocated by the Indian-born American scientist. For years, I've (sketchily) followed these claims and counterclaims. And the conclusion that I have come to is, that they are all equally questionable. I gotta wonder, the constituency of the sand, ash, and other raw materials, are they all substantially the same ? Same quality of ingredients? Same consistency of combinations and processing? Matching elements? That guy over here, utilizing the same methodology as the other guy over there and they both have conflicting results. While running the same experiments. However, one supply of sand came from a pit along the Ohio River and the other sand was dredged up along the Elbe. Will utilizing organic and inorganic materials produce differing results? Perhaps, just perhaps? All these conflicting claims share a valid conclusion. If you ignore the results of opposing experiments? I dunno why don't you ask real experts like the ones in the article? I'm sure they know lots more than you do.